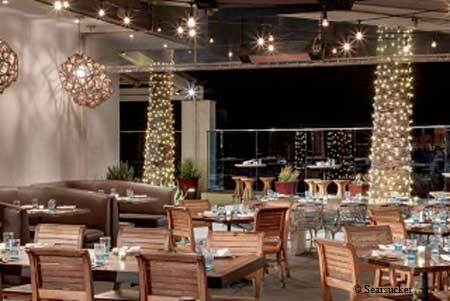 A North County location of the buzzy New American restaurant with eclectic cowboy décor. : This second San Diego outpost of Searsucker also features an eclectic cowboy décor, with distressed wood, antler and rope chandeliers, and cowhide-printed ottomans. The New American menu ranges from beer-braised short ribs to salmon with couscous to a burger with duck fat fries. You won’t regret splurging on a side or two, like the deep-fried Brussels sprouts enhanced with walnuts. For dessert, indulge in soft, warm chocolate chip cookies that arrive straight from the oven, with a coffee float.